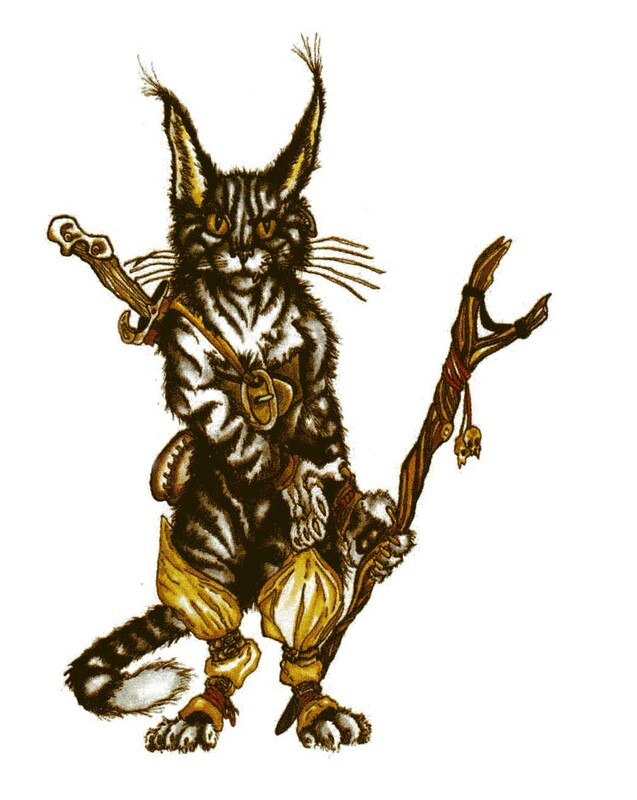 The frey are a race of bipedal intelligent cats, about the size of a large tabby, who aim to explore the many nooks and crannies of the Forge with their great agility and winning charm. A frey lives for themselves first and foremost. Strong-willed with hard pride and often contemptuous of authority, a frey uses its considerable charm to often defy those who give them orders. Even advice or recommendations are often treated as a chance to demonstrate independence - no one tells a frey how to live. They put their lives to use as they choose — and they often choose to delve into things they have not seen or exprienced before. Frey are intensely curious creatures, always wondering what is around the next corner, hidden behind a door, or lost in a cavern. Frey are willing to risk their own lives for their curiosity and their independence. Frey resemble rather large domestic cats who have decided to walk upright. They have thumbs with which to wield implements, but their clothing is purely functional. A frey feels completely comfortable in nothing but fur, but will often don a pair of thick boots or waders to stop the fur on their legs from getting wet. Frey have a reputation for trouble and chaos that follows them around. Perhaps born out of a frey's need to satisfy their curiosity, the trouble that follows them means that their charm and wit carries with it a slight reputation for danger. Frey are also quite secretive about their own lore. Frey don't teach their language to outsiders, and will often refuse to share knowledge with their close friends and allies unless absolutely necessary. Most frey bear a single, simple name that they commonly go by, and a clan name inherited from their mother that highlights a physical characteristic known to run in the family. Ability Score Increase. Your Dexterity score increases by 2. Your Charisma score increases by 1. Age. An frey becomes an adult by age 12, and typically live to be about 50. Alignment. Frey are typically chaotic good. They see the world as a big place to explore, and don't like to be tied down while they do it. Size. Frey stand about 2 1/2 feet tall, and typically weigh about 25 lbs. Your size is small. Speed. Your base speed is 20 ft. However, you can drop down on four legs and increase your speed to 30 ft. as long as your hands are free. Darkvision. Your cat-like eyes expand to take in more light when it is dark. You can see in dim light within 60 ft. of you as if it were bright light, and in darkness as if it were dim light. You can't discern color in darkness, only shades of gray. Catlike Reflexes. You have advantage on Dexterity saving throws, and you can treat falls as if they were 10 ft. shorter for the purposes of falling damage you take.